Mrs. Charley Cook died Aug. 5th. She leaves three children, one infant of a few weeks. Her funeral took place from the Methodist church Sunday morning. Marion Jones Sandford died Sunday 7th. She was buried yesterday afternoon. Her death was a great shock to the community a great grief to her mother. She was only sick a week or two with typhoid fever. Aged 19. She had been sick for several weeks. Tommy Hubert died Sept 16th at Smithville. He was with the 17 year old boys – the Junior Reserves. His mother was with him during his illness and brought his body home. Source: Malinda Ray Diary, Southern Historical Collection, UNC Chapel Hill. This is the day of electing our Governor. No one has any doubt of Gov. Vance’s election but everybody is anxious for him to leave that miserable traitor the self made candidate WW Holden behind. Holden received 3 % of the votes here. I am extremely anxious to hear from Buddy. The deserters announced their intention of returning to Yadkinville and controlling the polls. And I am afraid it will be a stormy day. I wish Holden could be choked. We moved out in the country last week. It is mighty pleasant out here but hated to leave Cousin Sally & all of them there right badly; but I hope they will spend a good deal of time with us. Miss Bena went to her own home when we moved out here. She was getting a great deal stronger & better but she was taken sick on going home & has been quite sick ever since. Benny Robinson got home last Saturday week 24th July. He is very lame & uses both crutches. I think he will probably always be lame. Neill Ray is here in the hospital. He lost his foot in one of the fights before Richmond. He seems to be getting on as comfortably as possible under the circumstances, but he is not well enough to go to his home which would be to far in the country to receive proper medical attention. Buddy is still in Yadkin county. That part of the state is in a dreadful condition. It is filled with tories deserters. They rendezvous in Tennessee, near the border and the 4th of July sixty of them entered Yadkinville at night and demanded the keys of the jail; the jailer delivered them up and they released four deserters who were confined for the murder of two respectable loyal citizens. Then they fired on the Village and left it. After that they visited the house of the Capt. of the Home Guards made him surrender his arms. The 18th of July the Home Guard and these deserters met at the Quaker meeting school house & were engaged in a fight two men were killed on either side. They swear they will take Buddy & carry him to Tennessee. They have an special spite at him because he is an officer. I am afraid I was rather hasty in my conclusion that peace was so near. For the Yankees seem determined to remain blind and deaf to the fact that we will never give up; & a good whipping only makes them go to work with renewed vigor. We have every success and their defeat. Cousin William left here Saturday 14 [April 1864]. He had been here a little more than two weeks. His health was so bad when he returned to the army after his visit in the winter that when the preparations for the Spring campaign began the surgeon ordered him to the rear. His sister, Mrs. Malloy is very ill out a Gillopis & he has gone out there with her. Thus far this has been a glorious campaign for us. Everybody seems confident of success & though all those who have loved ones in the field are enduring the most intense mental suffering & anxiety yet the people as a body can rejoice with all their hearts. Washington & Plymouth NC have been recaptured by our forces under Gen Hoke & although the Yankees burnt almost the whole of Washington still the people and the surrounding country are freed from Yankee rule and then the productions of that fertile part of the state will be such a help to us. If all we hear from our armies is true it is such a victory as not country ever witnessed and the brightest day our confederacy ever saw & peace must be near. News was rec’d here last week by the family of the death of Maggie F Nash. 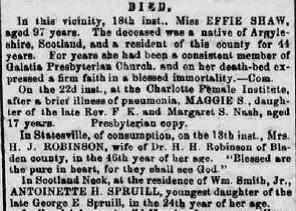 She died the 22d in Charlotte after a few days illness of pneumonia before any of her relatives could reach her. Source: Fayetteville Observer, March 28, 1864 as found on http://www.ncecho.org.